If tonight’s news reports about Greece are to be believed then for the next day or more, Greece’s banks will remain closed and capital controls will be introduced. So what are capital controls and how do they work? Capital controls are basically designed to prevent money flowing out of a national banking system. In this case, it’s the Greek banking system. This means limiting the amount of money which can be withdrawn from banks or cash machines in any one day and also limiting the transfer of money out of the country. These restrictions are imposed because – in the face of a possible collapse of the national banking system – many people would likely try to withdraw their savings or even move their money to another country if their daily withdrawals were being restricted. They may also be concerned about the threat of a one-off tax on savings being imposed to help the government fund expenditure, keep the banking system afloat or even to secure a bailout deal. You may remember this fear being a hot topic of discussion the last time capital controls were imposed on a European nation, when the banking system in Cyprus collapsed back in 2013. It is possible that some pre-approved overseas transactions may be allowed to take place if they are deemed to be necessary or vital. If they are not deemed to fall into this category however, then as of tomorrow the following restrictions are likely to be applied to Greek banking deposits. How will capital controls work? In the case of Greece it is believed that capital controls will take the following form. Firstly, it is believed that the banks will be closed on Monday, a bank holiday will be imposed. 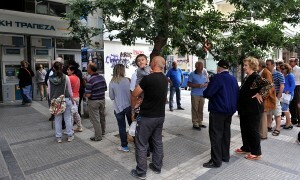 Greeks will be allowed to withdraw a maximum of €60 (£42; $66) from their accounts in any one day. Overseas transfers of cash will be prohibited unless they are deemed to be vital or the transactions are pre-approved commercial ones. The Greek government may also limit Foreign Exchange transactions. The Athens Stock Exchange is also likely to be closed on Monday to prevent a Greek stock market crash. We can clearly see that capital controls are implemented and designed with the intention of protecting an already unstable banking system in Greece from complete collapse. Is the Greek government allowed to impose capital controls? According to the founding treaties of the EU, money is supposed to be allowed to flow freely within member states, so the introduction of capital controls in Greece would run contrary to these founding principles. As we mentioned earlier though, it has happened before when the Cypriot banking system was close to collapse in 2013. In effect, this move further increases Greece’s likelihood of leaving the Euro. Is a Grexit now inevitable? The crisis in Greece – and The Eurozone Crisis – has been dragging on for years now and up until a few weeks ago, there seemed to be no real end in sight. As mentioned in a recent post though, things really seem to have been coming to a head in recent weeks. An Austrian Finance minister today said that a Greek exit from the Euro was now almost inevitable. The coming days will likely show whether or not this proves to be the case. For now though, we can expect more talk of the Greek referendum and of a possible deal as both sides continue to blame one another for the current crisis, while insisting that the door remains open for further talks. That’s assuming that Greece’s banks can make it through the coming days, of course. Do you think that a Grexit is now inevitable? How Long Can Europe keep Playing Pass The Bomb?